Our PTA is thrilled to host Dr. Denise Pope, Founder of Challenge Success and nationally acclaimed author and speaker from the Stanford Graduate School of Education, April 22, 2019 in the Sea King Theatre at 7pm. Join the parents of the class of 2019 for a fun festive evening out to support Grad Night! Dr. Denise Pope, founder of Challenge Success, from Stanford to Newport to speak with teachers, administrators, some students and staff during the daytime and parents in the evening on Monday, April 22 at 7pm in the Sea King Theater. Our Honorary Service Awards is one of the most feel-good PTA meetings of the year! Come early for coffee and breakfast treats at 8:45am. 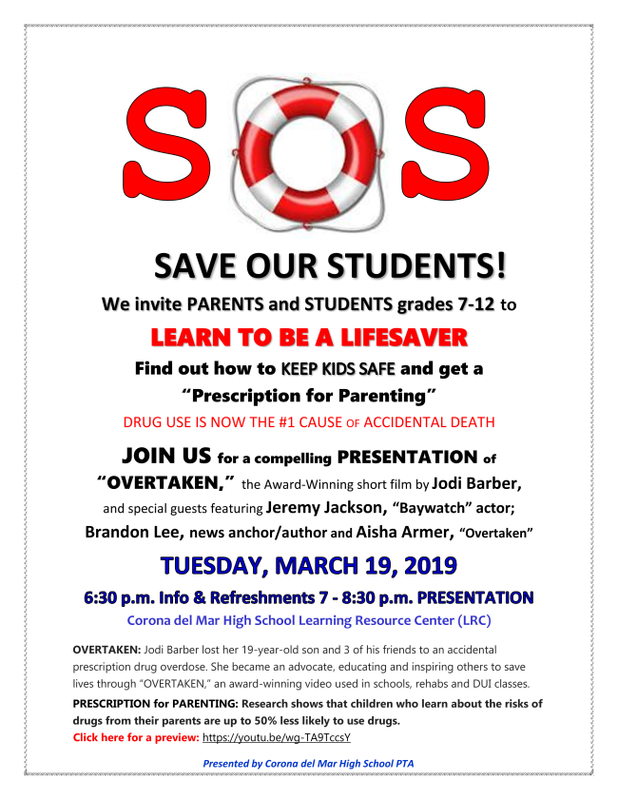 Please JOIN US TUESDAY, MARCH 19 and find out how to SAVE OUR STUDENTS as we see a compelling presentation of "OVERTAKEN" by Jodi Barber and special guests and their "PRESCRIPTION for PARENTING." Learn how to deal with the drug epidemic and save a student, a friend, or a family member. The meeting will be held from 7 - 8:30 p.m. in the LRC. The PTA invites parents and all students grades 7-12 to join us. Refreshments will be served beginning at 6:30 p.m.
A chance to visit, celebrate and bring an auction item for the Grad Night Parent Party! A ticket for the luncheon is $75 per person or a donation of an item for the silent auction worth $75 or more. Purchase your ticket online at cdmpta.com or RSVP and make arrangement to drop off your auction item or payment to Amber Snider at essays1@cox.net.